The house is situated near the well-known Casa de Los Balcones and the Town Hall. It is very easily located once you have entered the historic centre of La Villa de La Orotava. 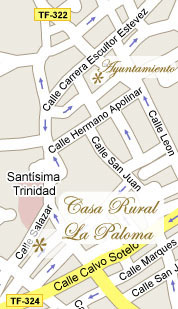 From the Town Hall, take the alleyway that leads to Casa de Los Balcones< and from there you will come to calle Salazar. After around 200 metres, you will reach Casa Rural La Paloma. Please feel free to contact us should you need more information about how to reach the house.